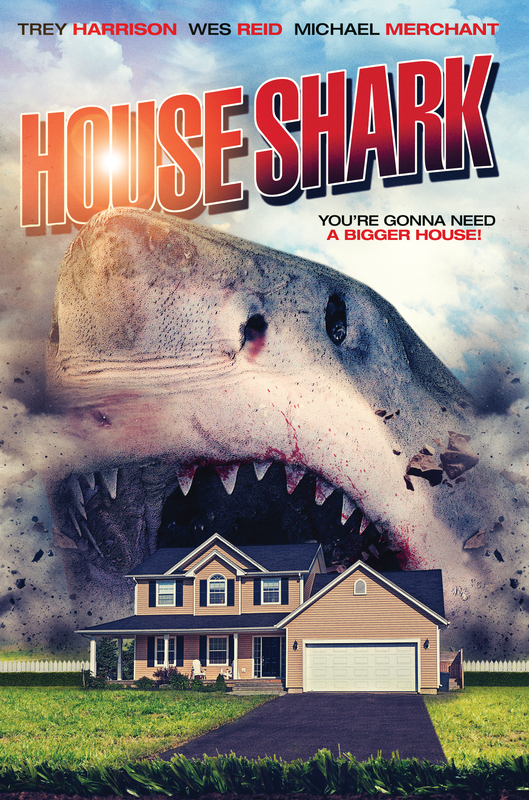 You're gonna need a bigger house! Just when you thought it was safe to go home! When Frank (Trey Harrison) finds his happy home under attack by a dangerous but largely unknown breed of shark, he's enlists the aid of the world's only "House Shark" Expert, Zachary (Michael Merchant), and a grizzled former real estate agent, Abraham (Wes Reid), to embark on a desperate quest to destroy the beast and claim back his life. It's JAWS in a house! From writer/director Ron Bonk. Produced by Ron Bonk ("She Kills", "Clay") & Jonathan Straiton ("Night of Something Strange"). Starring: Trey Harrison, Wes Reid, Michael Merchant, Wayne W. Johnson, Nathan Bonk, Melissa LaMartina, Jennie Russo, Samantha Varga, Edward Mastin, Brett Janeski. SPFX by Marcus Koch and Matthew Ash. Score composed by Emmett Van Slyke. Producers Jonathan Straiton, Tim Ritter and Howard Gromero. Played Boston SciFi Film Fest, the USA's oldest Genre Fest in it's 43rd year. 'One of the most entertaining films I've seen in a long time!